I was away from the blogging scene as I was on a one week fast, fighting against corruption. But being someone who is modest and homely, I did not publicize it like the Hazares and the Ramdevs. I finally broke my fast when I found that Emraan Hashmi is gonna act again. Due to my fast, I have a developed a size -zero figure again and with this figure, I was able to do all the nautanki stunts that I used to do when I was a teenager. The head spin is one of my favorite stunt moves. My niece and nephew (Jolena and Jeremy) are in India and they happened to see the head spins and immediately with the same nautanki blood flowing in their veins, they wanted to follow suit. 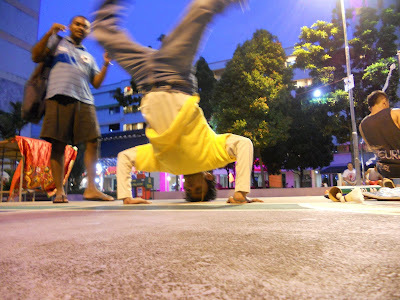 Jeremy tried the head stand, many a times and when he discovered that it involves a systematic process, he came to me and said, "Maamaa, Teach me the head stand"
The one and only head stand - for the first time in this blog. Step 1 : Stand on all fours like a dog and place your palms on the ground. The pressure should be given to the hands. Step 2 : Place your hand on the ground. Make sure that the head and the two palms form an equilateral triangle on the floor. Give less pressure to the head. Don't place the forehead on the ground. You might dislocate your neck. Step 3 : Now, put all your body weight on your two palms. The head is used just for the support. If you are trying this for the first time, use a soft surface. Never try this immediately after a meal. Jeremy tried the Head stand too. He has not succeeded doing it perfectly so far. But he has the confidence and the never-say-die spirit. So he will do it. Poor Jolena was watching all the stunts from a corner. She came to me and said, "Maama, Let us watch TANGLED ". All three of us, then watched the Rapunzel fairytale (Tangled). I have started liking animated movies. In fact, I have started talking like the characters in the animated movies. This snap is for all the blog readers. Please try the head stand and take pictures of your head stand and send to me at prason@chronicwriter.com. I will feature those pictures in my blog. "I did not publicize it like the Hazares and the Ramdevs". nice post dude, i liked it. btw, make headstand a publicity gimmick and say you are doing hand stand in public against corruption. or lets say form a hand stand corruption party.. err i mean anti corruption party. I demand a fictional comedy not including you or your life's events. Something new and innovative. hope its not too much of a demand? ?